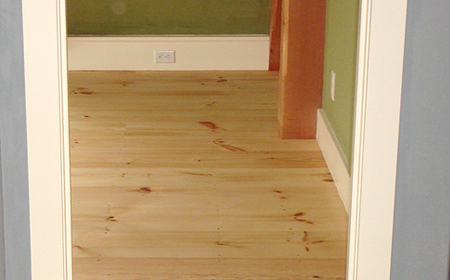 Wide pine flooring is sold as individual wood boards (planks). These pieces can be ordered at one uniform width or in various widths for a more organic layout. In order to receive an accurate cost estimate for your project you must first measure your floor space and then determine a board type. To calculate the square footage of a room you need to multiply the length of the room by the width. An important note to remember when measuring is: you do not want to get precise. Measure from the longest point in both directions and round up. For example, if the room measures 12'5" x 9'5", round up to 13'x10'. In this example, the square footage is 130 square feet (13 x 10). You will then want to add an additional 10% waste factor to the total square footage of the room. Keeping with the same example, you should order 143 square feet (130 x 1.10). Eastern White Pine, premium and better grade. This pine has been kiln dried and surfaced on four sides to a finished face. Joined straight and ripped parallel, this wide pine flooring is ready for installation. Flooring is available in 4" - 20" and can be purchased in random width or same size. Custom widths are available, please call or email us for more information. 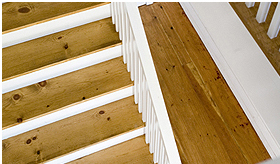 Traditionally the square edge is used for wide pine flooring, but we offer tongue and groove and shiplap as well. Southern Long Leaf Heart Pine. The beauty of Pine... the durability of Oak! Long Leaf Heart Pine has long been cherished for its warm, traditional colonial look. Each board is cut from the the heart of the beautiful southern pine tree, producing a tight vertical grain structure that makes this the most durable pine floor there is! For orders under 500 square feet, there will be a $200.00 processing fee. Payment can be made via check, MasterCard or Visa. A 50% nonrefundable deposit is required to place the order with the balance to be paid in full before shipment.